Space the final frontier; space has been intriguing us for generations, and we continuously make constant efforts to explore it. And now we have these cool space themed products to make up your day..
Spaceship Bed: How about getting a spaceship for your little astronaut? 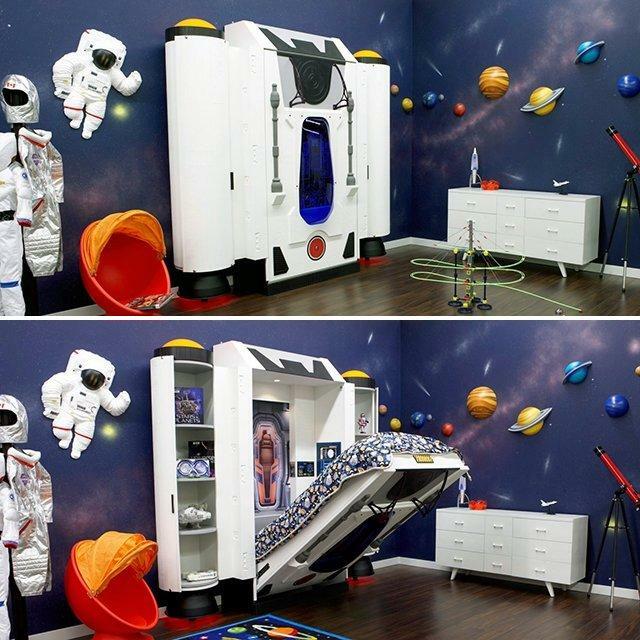 The Spaceship Bed is a spaceship themed bed that turns your little astronaut's bedroom into Ground Control for galactic adventures. Unlike most of the kids' beds, this one won't take the play space in your kid's room; the mattress can be raised to create extra play space during the day. 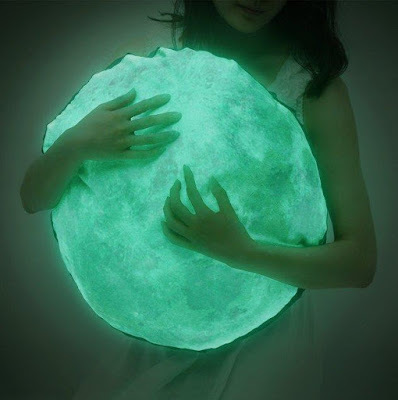 It features paperthin electroluminescent light panels that are cool to the touch, controlled with an electronic keypad, and perfect for nighttime stories. It measures w: 99.5", h: 94", d (closed): 21". Buy Now. 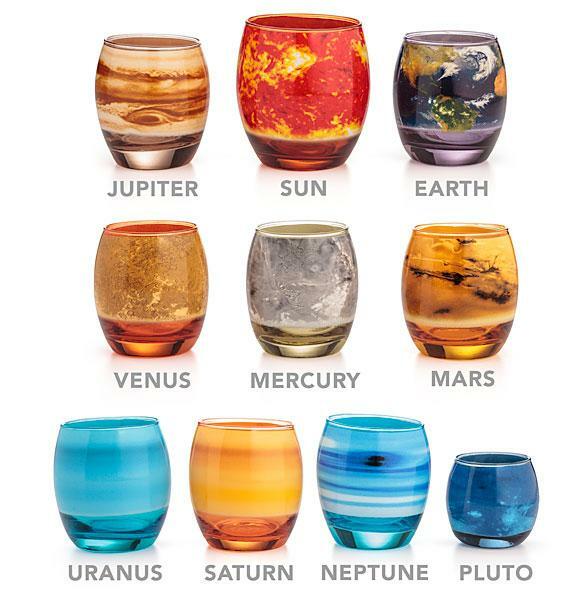 Planetary Glass Set: The Planetary Glass Set consists of ten glasses, each glass representing one of the planets in our solar system. Buy Now. 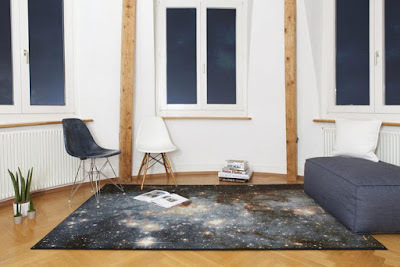 Space Carpet: For those who have always been fascinated by space, this Space Carpet takes its inspiration by Hubble telescope images and brings the space into your home right under your feet. Buy Now. Galaxy Wallpaper: The galaxy wall mural looks so photo-realistic and is sure to create an impression as if your room is a doorway to space. Buy Now. 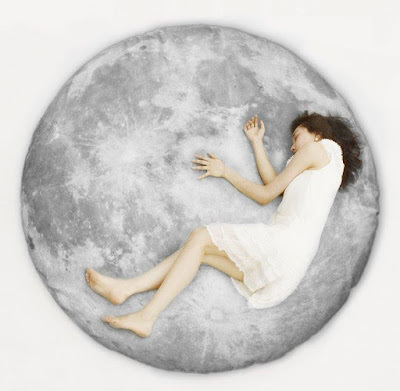 Full Moon Floor Pillow: The Full Moon Floor Pillow is perfect for taking you away from the real world to the dream world, where you can even sleep on the moon. Buy Now. 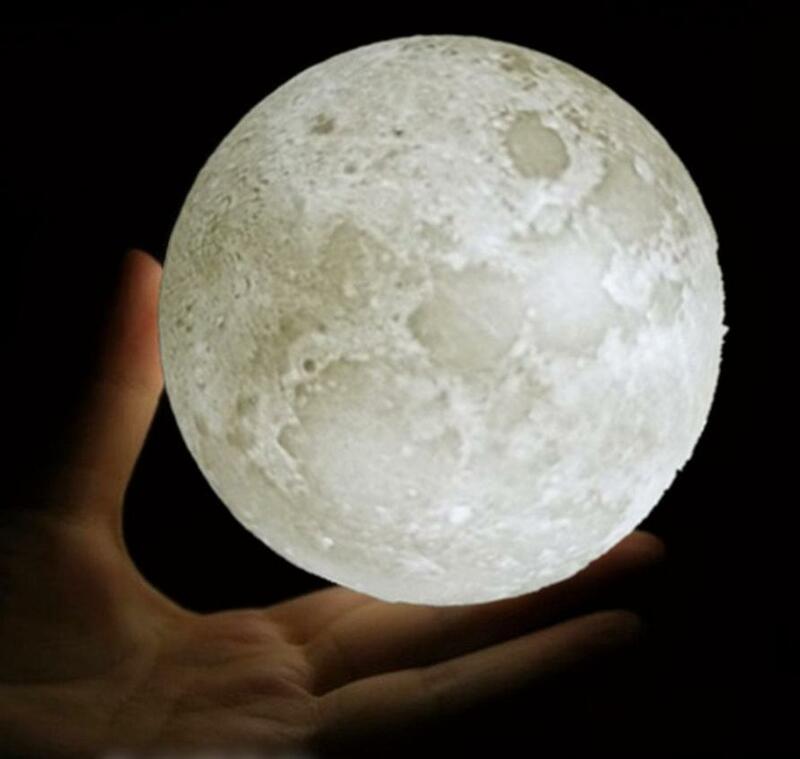 Moon Lamp: The Moon Lamp is a cool night light that features a realistic moon shape with rough landscapes, mountains, lunar mare and gives your own personal moonlight. Its rechargeable, comes with USB port, features adjustable brightness, and you can change color by touch switch. Buy Now. Astronaut Duvet Set: During your childhood you must have dreamt of becoming an astronaut or least known someone who wanted to become one. 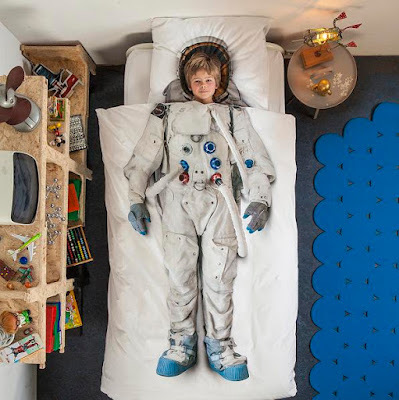 The Astronaut Duvet Set creates an illusion as if your kid is wearing an astronaut suit when sleeping. It comes with realistic astronaut photographic print; the set consists of a single duvet cover and a pillowcase. 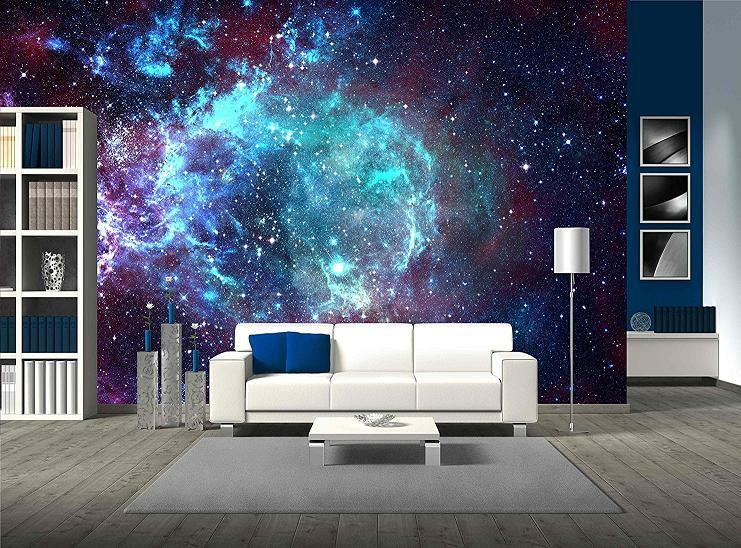 Perfect for motivating kids to know about space. Buy Now. 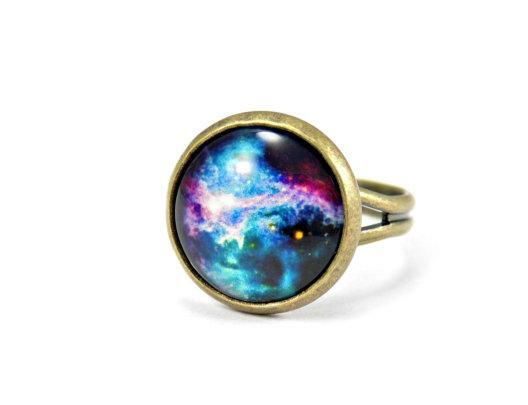 Galaxy Ring: Now who wants to wear a galaxy around their finger? Buy Now. Aroma Plus Home Planetarium: Now one can enjoy aromatic experience while star-gazing in complete relaxation while bathing. Buy Now. Space Pencils: The Space Pencils are just perfect to draw distant planets and galaxies. 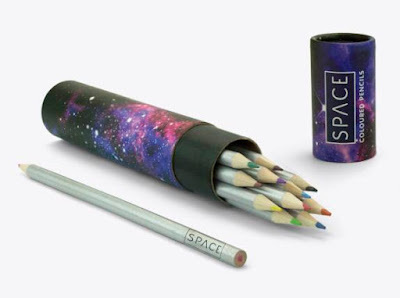 The set of 12 color pencils come in colorful nebula print case. Buy Now. 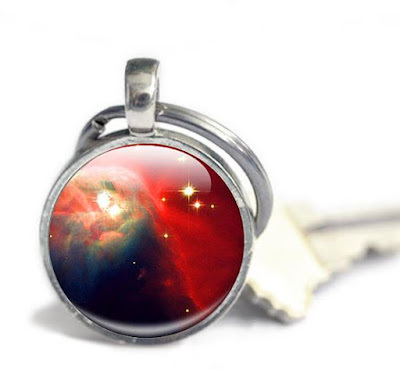 Space Keyring: The Space Keyring measures 1 inch / 25mm in diameter, comes with silver plated bezel, and the image is encased behind a glass dome. This handmade keyring is perfect for stargazers, astronomers, and more. Buy Now. 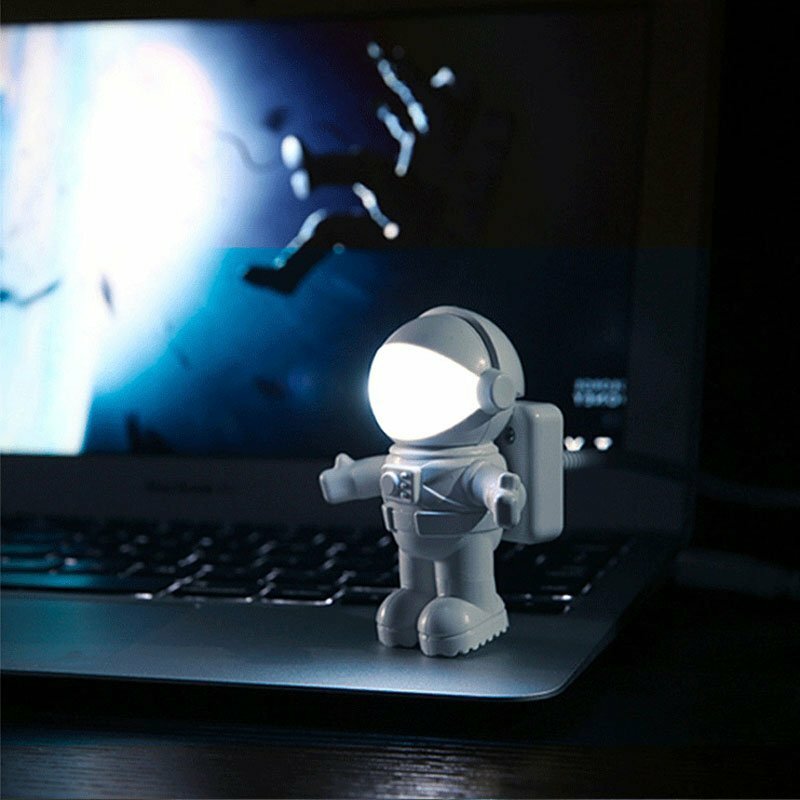 Astronaut USB Light: The Astronaut USB Light is a USB powered light that comes in the form of an astronaut, works with laptops, computers and any other USB power source. To turn it on, just push the helmet and to turn it off, close the helmet. You can adjust the light to different angles to brighten needed areas. Buy Now. 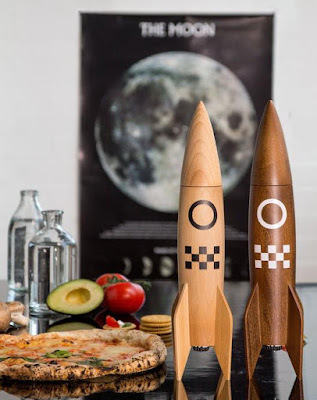 Salt and Pepper Rocket Mill: No dining table is complete without Salt and Pepper set and what can be better than having a Salt and Pepper Rocket Mill on your dinner table. The Salt and Pepper Rocket Mill looks like a typical rocket, is 14" tall, made from solid beech wood, features ceramic mechanism that provides the best performance and a simple twist adjustment sets the coarseness. These are perfect to bring out the perfect taste of your food. Buy Now. Rocket Armchair: Kids and their curious world is full of imaginations, a simple cardboard box for them turns into a cave, boat or even a ship. As they grow, they start to understand the world around them, and added to that the formal education surely takes away the innocence and with that goes the world of imagination. Its not that all the kids lose their world of imagination, if they did then we wouldn't be having these great movies, novels, books and a lot more. But then again how many of us have the same imagination what we had as kids? Now when we try to imagine, there are logics that come into the picture first. Do you think as grown ups we are still capable of imagining that we can hold a huge leaf and fly off? How about you? Well if you really want your kids to enjoy a lot more than the cardboard box as their space ship then we have for you the Rocky Rocket Armchair. It's perfect for your little astronauts who want to go on an adventure, play super heroes and explore the universe. It features a light and sound system that is app controlled, and gives you several options like choice of music, light effects, and sleep time. Its four engines are your storage sections and the staircase has a small secret safe for you to hide your valuables. 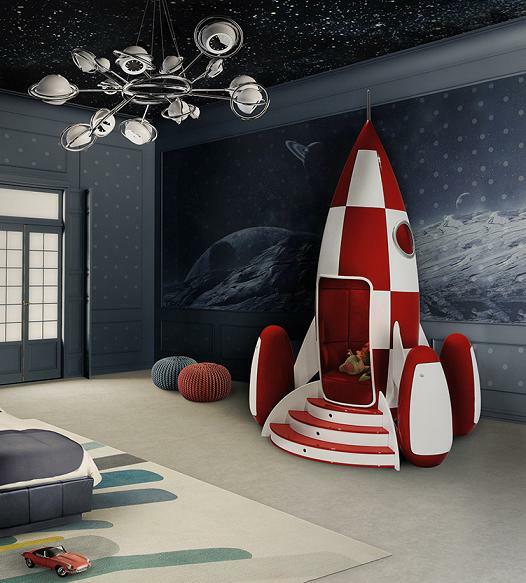 Kids are sure to connect this Rocket Armchair with the Pixar movie "Toy Story" where Buzz Lightyear who believes himself to be a true Space Ranger protecting the Universe, and grown ups can think of Tintin when looking at the armchair. Buy Now. 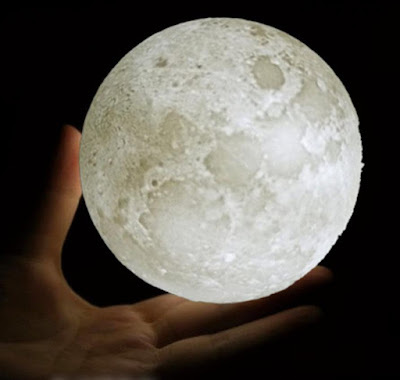 Moon Cushion: The Moonlight is a full moon shaped cushion that glows in the dark, features a real image of the moon, and gives out a glow making it perfect for cuddling. Buy Now.